NASHVILLE, Tenn. – In the wake of a divisive political climate and rapidly growing local landscape, six African-American women have joined together to form The Equity Alliance, a nonprofit advocacy group whose mission is to proactively advocate for African Americans and other communities of color to have a fair and just opportunity at realizing the American dream. Launched in January 2017, The Equity Alliance will host its first event, “A Conscious Conversation on Black Political Engagement,” in partnership with Conscious Conversation Wednesday, March 22, 6 p.m. at SEIU Local 205, located at 521 Central Avenue, to explore the state of Black political engagement and how Nashville’s African-American community can take action on issues concerning them. 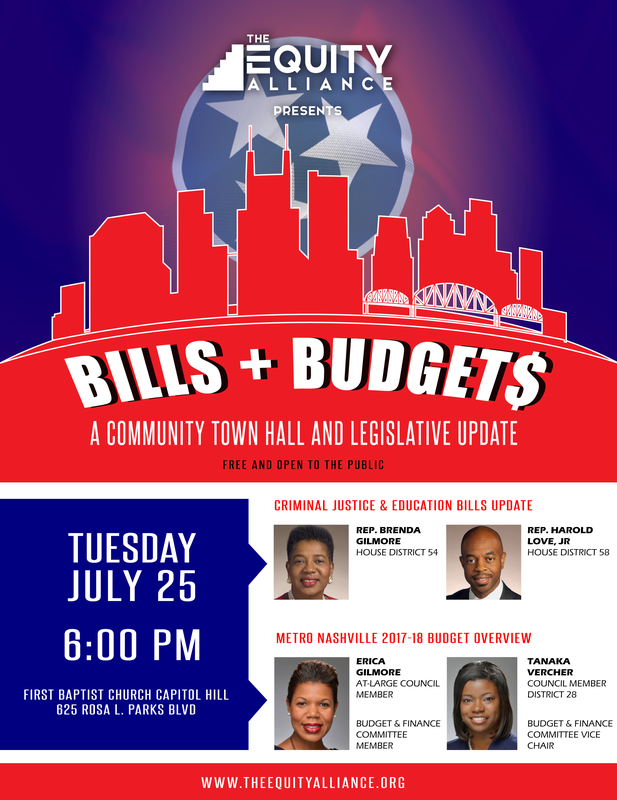 Confirmed panelists include: State Representative for the 91st District and Chair of the Tennessee Black Caucus Raumesh Akbari; District 5 Metro Nashville School Board Member Christiane Buggs; State Senator for the 29th District and Senate Minority Leader Lee Harris; Chief Diversity Officer for the Office of Mayor Megan Barry Michelle Hernandez-Lane; At-Large Metro Council Member Erica Gilmore; Executive Committeewoman for the Davidson County Democratic Party Matia Powell; and Christopher Smith, a political consultant and former Bernie Sanders 2016 deputy national field director. The panel and roundtable discussion will be moderated by Isaac Addae, Conscious Conversation co-founder and assistant professor of business at Tennessee State University. Attendees will have a chance to converse one-on-one with prominent Black political leaders in a roundtable-style forum. “We wanted to bring our community together to have an honest dialogue around the need for more diverse political leadership in Nashville, what action steps individuals can take to address issues with their elected officials and how The Equity Alliance can be the vehicle for improving equitable outcomes on the state and local level for marginalized groups,” said Board President Charlane Oliver. Other founding board members include Christiane Buggs, Mariah Cole (Executive Director), Tequila Johnson (Vice President), Kyonzte Toombs (Secretary and General Counsel) and Aerin Washington (Treasurer). While persistent economic and racial disparities exist among African Americans on indicators such as unemployment, home ownership, health, median income, and entrepreneurship, The Equity Alliance’s 2017 legislative priorities will focus on the two most pressing issues threatening economic prosperity for minorities: public education and criminal justice reform. 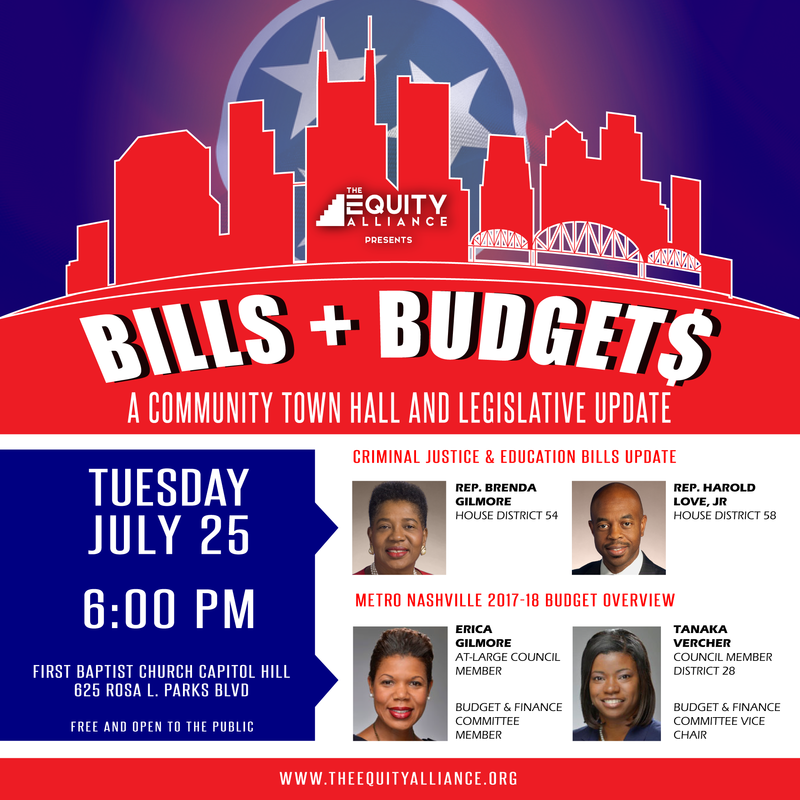 The Equity Alliance’s four core functions aim to monitor state legislation and local ordinances for discriminatory policies that create barriers to economic self-sufficiency; educate communities of color on relevant economic, social, and political issues and the implications of impending legislation; build relationships and create alliances in the Nashville community with similar mission-driven organizations; and empower individuals to take action, including turning out to vote in large numbers on Election Day. “Our goal is to inform those in our community on how their government works and why voting in every election matters,” said Oliver. Tickets to the Conscious Conversation event are free and open to the public. For more information and to register, visit www.theequityalliance.org. Conscious Conversation is a group focused on galvanizing the general public around issues of community and economic development in metropolitan communities. Efforts are concentrated in three main areas: Connect to bring the community together, facilitate networking, and generate synergy amongst like-minded individuals; converse to engage in healthy dialogue on issues that plague downtrodden communities; and create to formulate strategies leading to collective action on identified issues. Learn more at www.consciousconversation.co. The Equity Alliance proactively advocates for African Americans and other communities of color to have a fair and just opportunity at realizing the American dream. Established in January 2017, The Equity Alliance is a Nashville-based grassroots advocacy nonprofit organization that seeks to equip citizens with tools and strategies to engage in the civic process and empower them to take action on issues affecting their daily lives. Learn more at www.theequityalliance.org or follow on Facebook, Twitter, and Instagram.